The average cost of assisted living in New Iberia is $2,515 per month. This is lower than the national median of $3,346. To help you with your search, browse the 33 reviews below for assisted living facilities in New Iberia. On average, consumers rate assisted living in New Iberia 4.9 out of 5 stars. Caring.com has helped thousands of families find high-quality senior care. To speak with one of our Family Advisors about assisted living options and costs in New Iberia, call (855) 863-8283. In 2005 New Iberia, La., received the Great American Main Street Award® sponsored by the National Trust for Historic Preservation®. It is home to two assisted living facilities with another two located in nearby neighborhoods. In Louisiana, adult residential care providers are licensed at four levels: personal care homes, shelter care homes, assisted living facilities and adult residential care facilities. ALFs in New Iberia and elsewhere in La. provide personal services plus room and board to at least two people who live in their own space — at least a studio-type room with kitchenette and private bathroom. New Iberia is situated near the Gulf Coast, so you can expect a warm climate year round. Average temperatures for the area are around 68.8 degrees F. While the climate is ideal for those who like to keep warm, the hot, humid summer months can be difficult for those with sinus issues. 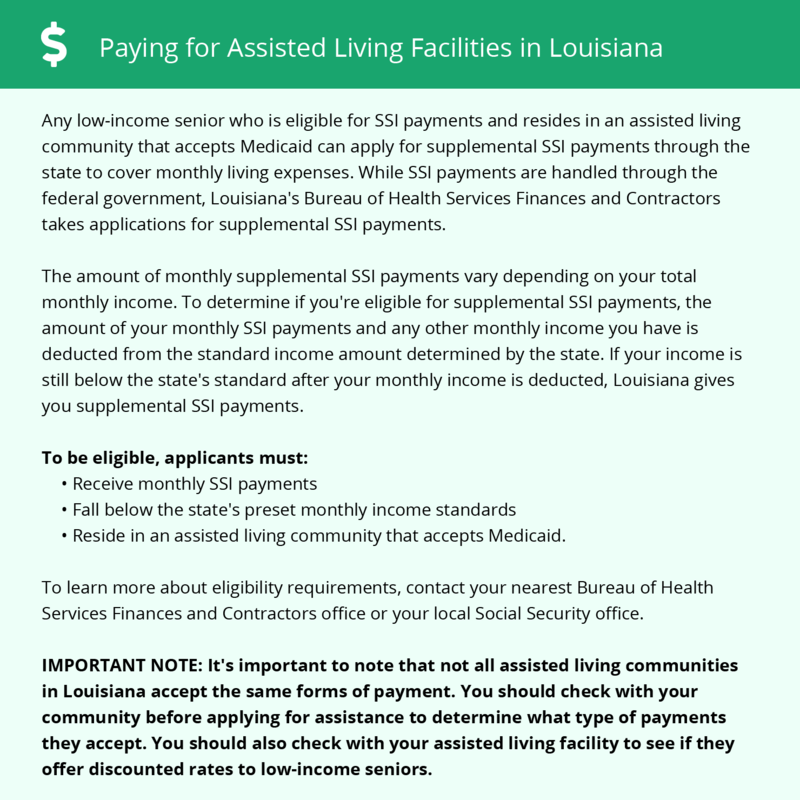 You can exclude your government retirement benefits and up to $6,000 of other retirement income each year from state income taxes in Louisiana, making an assisted living facility in New Iberia financially attractive. New Iberia has a high crime rate, so much so that it's known by those in the region as "the Little Chicago." While those rates are impacted by the area of the city you're in, and most assisted living facilities do have security provisions, it may deter some residents. New Iberia offers easy access to Cajun culture with numerous specialty residents in the city and surrounding areas, galleries and museums downtown and annual festivals such as the Festival of Live Oaks in March and the Sugar Cane Festival in September. The New Iberia area is home to world-class medical facilities, including Iberia Medical Center, in the event of medical emergencies or illness. New Iberia has a lower cost of living than the rest of the state and the national average, and health care costs in the city are especially low when compared to national numbers. Assisted Living costs in New Iberia start around $2,515 per month on average, while the nationwide average cost of assisted living is $4,000 per month, according to the latest figures from Genworth’s Cost of Care Survey. It’s important to note that assisted living rates in New Iberia and the surrounding suburbs can vary widely based on factors such as location, the level of care needed, apartment size and the types of amenities offered at each community. Individuals who qualify for Medicaid may be able to obtain partial or full coverage of assisted living facility services via a Community Choice Waiver, which allows Medicaid to cover ALF costs. New Iberia and the surrounding area are home to numerous government agencies and non-profit organizations offering help for seniors searching for or currently residing in an assisted living community. These organizations can also provide assistance in a number of other eldercare services such as geriatric care management, elder law advice, estate planning, finding home care and health and wellness programs. To see a list of free assisted living resources in New Iberia, please visit our Assisted Living in Louisiana page. New Iberia-area assisted living communities must adhere to the comprehensive set of state laws and regulations that all assisted living communities in Louisiana are required to follow. Visit our Assisted Living in Louisiana page for more information about these laws.